"The longest journey starts with a first step." Today is and you could take your first step now, by enjoying your FREE TRIAL CLASS at our Institute. The first in a series of five, Volume I: WAI DAN CHI KUNG, by Sifu Dan-Horia Chinda, is designed to provide the student with a very detailed explanation of the Wai Dan (the still and moving forms of CHI KUNG) integrated with meditation and breathing (the essence of CHI KUNG). In the process the student will learn the DA MO and the PA TUAN CHIN. Now available on Video or DVD. Preview clip 1. Preview clip 2. The second in a series of five, Volume II: YANG TAI-CHI CHUAN, by Sifu Dan-Horia Chinda, is designed to provide the Tai-Chi student with a very detailed explanation of the Short Form, starting with Tai-Chi Chi-Kung (Fundamental Tai-Chi Movements & Explanations). 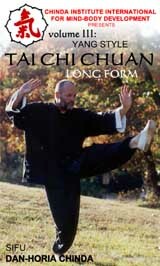 This tape continues with the presentation of the Tai-Chi Short Form offering detailed close-ups. The martial explanations offered by the tape provide the most comprehensive detailed instruction at the intermediate level. Preview clip 1. Preview clip 2. Preview clip 3. 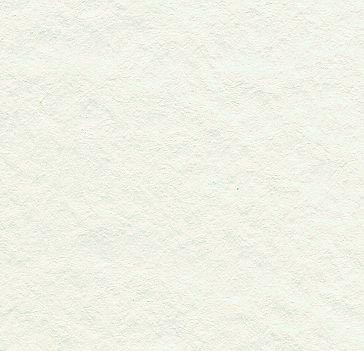 The third in a series of five, Volume III: YANG STYLE TAI-CHI CHUAN LONG FORM, by Sifu Dan-Horia Chinda, is designed to provide the Tai-Chi student with a very detailed explanation of the Long Form. The tape exhibits the entire Form in a continuous flow from beginning to end and demonstrates multiple camera angles and close-ups for a more complete illustration. 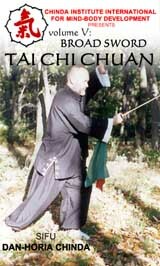 Explanations offered by the tape provide the most comprehensive detailed instruction at the advanced level of Tai-Chi Chuan. The fourth in a series of five, Volume IV: PUSHING HANDS TAI CHI CHUAN, by Sifu Dan-Horia Chinda, is designed to provide the Tai-Chi student with a very detailed explanation of the partner work. The tape exhibits the basic aspects of the so called "pushing hands" in a continuous development, from the very simple pushing form at the beginning, to more complex combinations as the level of knowledge grows. 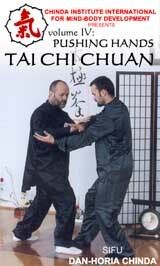 The tape presents the practitioner with multiple camera angles and close-ups for a more complete illustration.In the end, Sifu demonstrate multiple applications of some basic Tai Chi fighting forms against various attacks. The martial explanations offered by the tape provide the most comprehensive detailed instruction at the intermediate level. The fifth tape in a series of five, Volume V: YANG TAI-CHI CHUAN BROAD SWORD FORM, bySifu Dan-Horia Chinda, is designed to provide the Tai-Chi student with a very detailed explanation for one of the most classical weapon in Tai-Chi; The Broad Sword. The tape exhibits the entire Form in a continuous flow from beginning to end.At certain key element in the Form, multiple camera angles and close-ups are used for a more complete illustration. 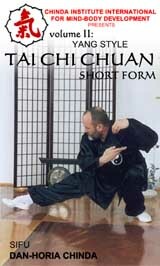 Explanations offered by the tape provide the most comprehensive detailed instruction at the advanced level of Tai-Chi Chuan. Presenting the 26 Traditional Shotokan Katas, Shihan Chinda gives the student the opportunity to learn more than just the form of a Kata. 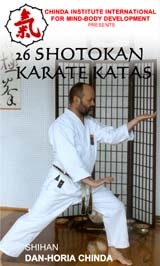 Each of the Kata's is explained in its performing form, with all the correct rythm and power, and in a study form. The study form is performed at half speed. By presenting each Kata in such a manner, gives the student the opportunity to learn both form and Zanshin. Preview clip 1. Preivew clip 2. 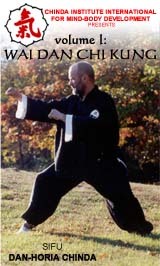 The Chinda Institute International is dedicated to presenting instructions in martial arts, meditation, and Far Eastern exercise techniques in a traditional, noncompetitive atmosphere. The emphasis is on creating a greater awareness of one's mind, body and spirit, and the personal power that awareness creates. Led by our world renown Master, the Institute strive to provide the modern practitioner with the proper tools in understanding the philosophy and form of the various Art we offer.